Deb's Cup of Tea: I like this. Last Thursday, Jessie and I got together for dinner. We hadn't seen each other all summer so we wandered over to Stratford Square Mall and ate dinner at Red Robin. After this, we walked around the mall winding up at JC Penney where I looked at new purses. You have seen a similar photo before. But this is what the tear has grown into. It's become rather bad. I suppose I could have taken it to a repair shop, it is a leather purse and would last longer. But my wallet has also been falling apart. The section where my driver's license and other things go is torn. The zipper on the coin pocket doesn't close anymore. I've had this wallet for a long, long time, but I was tired of fishing coins out of the bottom of the purse or pulling out the wallet, flopping it open and spraying coinage all over the counter. And then trying to get my driver's license out of the pocket with the tear and having it tear worse. 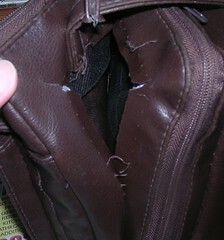 Yeah, it's time to just get a new purse and wallet. Every satchel was on sale, every one. I'm picky, really picky when it comes to something like this. That should be somewhat obvious because I have a purse I've had for years and I carry it everywhere. I used to change purses for the seasons and then said, "Why?" You guys have no concept. One wallet and that's got your life in it and you carry it around until, when you pull it from your pocket, only a quarter of it comes out. Then you duct tape it and use it some more. I only want one purse, one utilitarian purse, in which to put all my stuff, but it's got to be useful. Now comes the time to empty the old and organize the new. Yup, this is the contents of that purse. I don't carry a lot. I didn't realize how many business cards I actually had in the purse and I don't need to carry them. That blue container at the bottom middle holds my business cards and my work credit card. I don't give out that many business cards that I need to carry 200 in my purse. So, those have come to the office. Jessie was kind of concerned that the new wallet wouldn't fit into the purse. It all fits and fits nicely. I didn't realize that there is a pocket on each side for my cell phone. As I was heading to LaCrosse on Monday afternoon, I wanted to know the time and reached for my phone. It wasn't in the pocket where I thought it was. I had a fleeting moment of panic. "How can I travel without my phone?" But I realized that I'd taken thousands of trips without a cell phone. Yes, it is a huge convenience but I used to get on just fine without that instant communication. I can do it now. I stopped for a drink and gas. 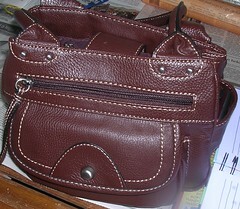 When I picked up my purse, there was the phone in the other side pocket. Eventually, I'll keep the phone on one side, but it will take a bit of getting used to where I put everything. 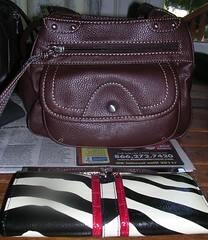 The purse was $14.40 and the wallet was $20. Excellent deals. I'm happy with them and I know they will give me long life. Now people can stop teasing me about the antiquated style of my purse. Doesn't this just inspire confidence? It's a box, part 2. It's a box, part 1. Why does it have to be in the middle of the week? Probably going to need help. So much for being outdoors. Merci. Danke. Grazie, Dank u. Gracias. Thank you. Down to my last bottle. Cats are another form of liquid.